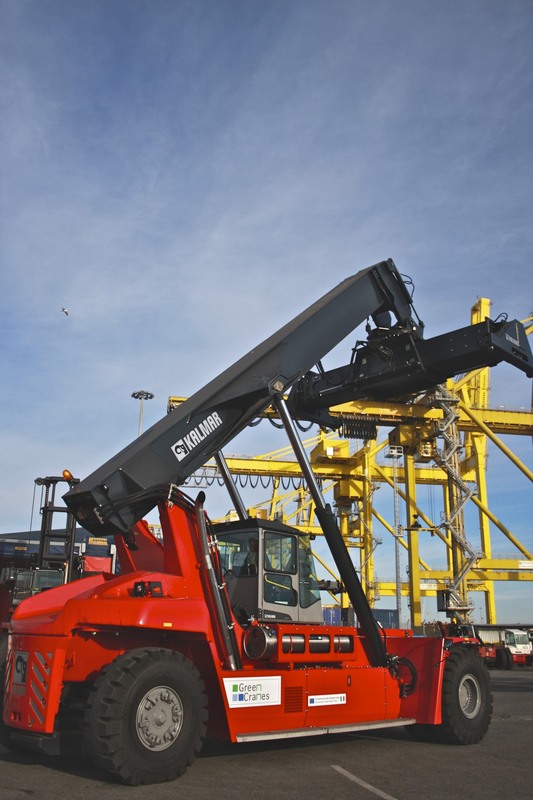 Kalmar, part of Cargotec, has demonstrated a new dual-fuel diesel and LNG (liquefied natural gas) powered reachstacker to the public at the Port of Livorno, Italy, on 16 January 2014. The visionary prototype machine was created in partnership with Kalmar's customer Global Service, the leader of the pilot and one of the most important players in the equipment rental business in Italy. The prototype reachstacker is expected to deliver significant results in terms of environmentally friendly operation. The machine is based on the adaptation of a Kalmar reachstacker to a motorisation for reducing the environmental impact and the energy consumption. Stefan Johansson, Director, Business Development & Product Marketing, Kalmar, said: "Kalmar is driving innovation in reachstackers ever since the 1980s, when we commercialised the first generation of reachstackers. Last year we introduced Gloria, our fifth generation reachstacker, which represents a milestone in reachstacker productivity and performance. This dual-fuel machine is expected to offer our customers an alternative for moving cargo in a more energy-efficient way as well as cutting down emissions at the terminal. "LNG as fuel is a future trend within the vehicle and shipping industries to reduce the exhaust emissions. When more and more ports will have LNG available, there will be possibilities to run also other terminal products on LNG. LNG will reduce the carbon footprint and there are also expectations on lower operation cost per hour. The demonstration unit shows up to 20 percent lower fuel cost per hour," commented Johansson. Liquefied natural gas is natural gas, mostly methane, which has been cryogenically super-cooled and condensed into liquid form for storage and transport. LNG is lighter than air, so when gas leaks out it evaporates into the atmosphere. By contrast, liquefied petroleum gas (LPG) is heavier than air and falls to ground level when released. The pilot is part of the GREENCRANES project aimed at developing green technologies and eco-efficient alternatives for port container terminals. Other participants in the pilot were the PerCro laboratory of the Scuola Superiore di Studi Universitari e di Perfezionamento Sant'Anna (SSSUO), Livorno Port Authority, RINA and the Ministry of Transportation and Infrastructure. GREENCRANES, Green Technologies and Eco-Efficient Alternatives for Cranes and Operations at Port Container Terminals, is a project involving three member states: Spain, Italy and Slovenia, including public administration, strategic ports, port industrial partners and innovation centres. GREENCRANES aims to study and define methods and measures to describe port container terminals' energy profiles, analyse different eco-efficient technologies to reduce their greenhouse gas emissions whilst increasing their productivity. It also aims to carry out pilot deployments of different potential solutions, extract relevant results from the pilot actions to be disseminated to as many port container terminals as possible and define standards that support the swift investment in these technologies across Europe.